The Wood Lamp is used by the esthetician to help analyze skin conditions. Complete unit single function machine. Comes with a cover and four bulbs. Perfect for your salon or spa. 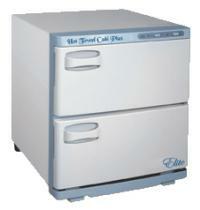 Keeps towels at around 160 degree Fahrenheit for refreshing, hygienic treatments. Large capacity bins will hold 48 regular manicure size towels or regular facial towels. Professional appearance will enhance any work area. Two doors, hinged right. Comes with removable stainless steel racks and a removable water plate. Keeps towels at around 170 degree Fahrenheit for refreshing, hygienic treatments. Holds approximately 24 regular manicure size towels or regular facial towels. 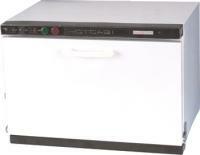 Comes with a built-in UV lamp sterilizer, power and sterilization switches, light indicators, removable stainless steel rack, removable water plate, instruction manual, and an extra fuse. Specially designed for shaving and styling eyebrows. Suitable for shaving facial hair for a smooth make-up application. Also great for grooming excess hair around the nape of neck, arms, and bikini area. Unique comb design safety guard for extremely sensitive skin. Comes with protective cap. Titanium steel professional quality. Great for nose hair, ear hair, and eyebrows. Can be used to cut moustache hair and unwanted facial hair. Can be used on babies and small children's nails. Curved blades for easy cutting. Titanium is rust proof. 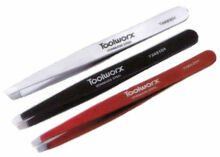 Professional stainless steel scissor tweezer for those who prefer a scissor like handle for tweezing. Perfectly aligned tips to grab the finest hairs. 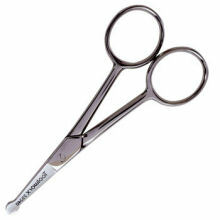 High Quality Facial Scissors. Convenient for everyday moustache and beard grooming. Preferred by professionals for eyebrow trimming. 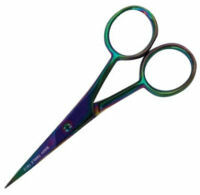 Can be used to cut linen wraps, fiberglass or embroidery. Extremely Sharp! Will not rust. Stainless steel with slanted tip. 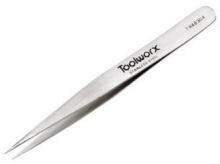 For shaping eyebrows and removing unwanted hair from brows, face, bikini line or any desired area with precision. Can also be used to remove splinters, ticks or foreign material from the skin's surface. Best to use after showering or opening pores with warm washcloth. Sanitizable, lightweight, stainless steel with slip-proof grip and pointed tip. Ideal for removing short hair or new growth. Remove unwanted hair from brows, face, bikini line or any desired area with precision. Can also be used to remove splinters, ticks or foreign material from the skin's surface. Best to use after showering or opening pores with warm washcloth. 4"
Sanitizable, stainless steel with pointed tip. Perfect for removing ingrown hairs, new growth, and splinters. Best to use after showering or opening pores with warm washcloth. Stainless steel with slanted and pointed tips. 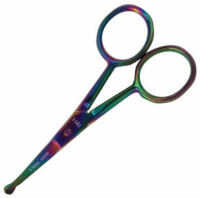 Slanted tip removes several hairs at once and pointed tip ideal for short hair or new growth. Remove unwanted hair from brows, face, bikini line or any desired area with precision. Can also be used to remove splinters, ticks or foreign material from the skin's surface. Best to use after showering or opening pores with warm washcloth. Polished stainless steel with slanted tip. Wide body for a secure grip. Remove unwanted hair from brows, face, bikini line or any desired area with precision. Can also be used to remove splinters, ticks or foreign material from the skin's surface. Best to use after showering or opening pores with warm washcloth. Sanitizable, stainless steel, double loop. Removes both blackheads and whiteheads. Flat side for removing blackheads, fine side for whiteheads. The extra thin and flat edges were specifically designed for safely and efficiently cleaning out the pores with minimum pressure to avoid harming the skin. Best to use after showering or opening pores with warm washcloth. Stainless steel tool with lancet and extractor. Ends unscrew and store in handle. Removes both blackheads and whiteheads. Specifically designed for safely and efficiently cleaning out the pores with minimum pressure to avoid harming the skin. Best to use after showering or opening pores with warm washcloth. Sanitizable, stainless steel, double loop, flat, texturized handle for sure grip. 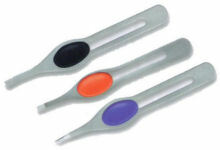 Extra-fine loops ideal for small details in removing both blackheads and whiteheads. Larger loop for removing blackheads, smaller loop for whiteheads. Specifically designed for safely and efficiently cleaning out the pores with minimum pressure to avoid harming the skin. Best to use after showering or opening pores with warm washcloth. 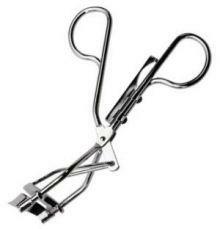 Chrome finish professional eyelash curler tool with refill pad conveniently stored in a built-in handle compartment. Used by professional makeup artists to lift and curl lashes in seconds. 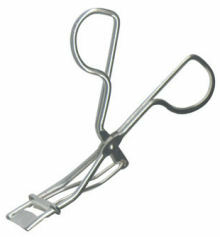 Chrome finish professional eyelash curler tool with removable white finger rest. Small size designed for curling outer lashes. Used by professional makeup artists to lift and curl lashes in seconds. Stainless steel tool with safety tip. Straight blade and safety tip for trimming hair from nose, ears, face, long eyebrows or other delicate areas. Safety tip protects skin from the cutting edge. Trim nose hairs carefully in front of mirror.